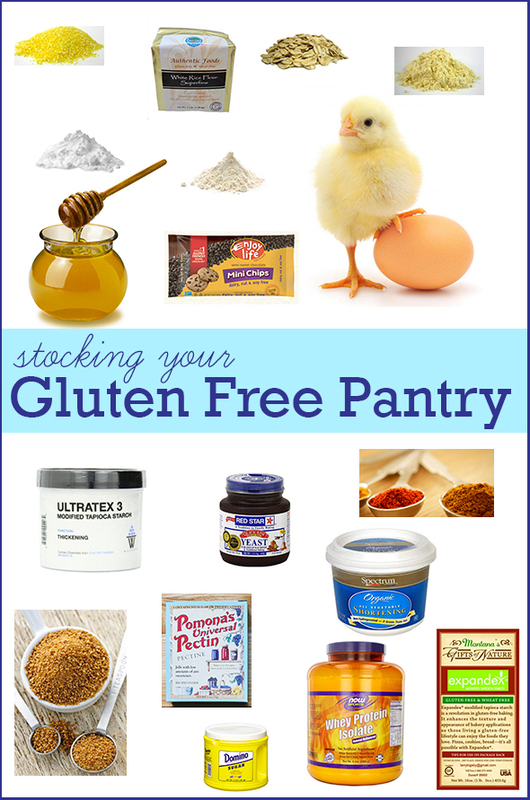 How To Stock Your Gluten Free Pantry for Baking | Great gluten free recipes for every occasion. I get a lot of emails. I have a page on FAQs which really does answer most Frequently Asked Questions. Nobody reads that, though. I’m convinced of it. But I so want you to be successful, and I so want you to see that it’s really not very hard to bake gluten free. So when you email me and ask where I buy this or that, or where you can find this or that, this is the link you’ll receive. It may take some time to get back to you, but the response will be super nice. Unless you’re mean or demanding, and then I’ll be pretty mad at you. Hint: don’t end your email with “please advise.” It’s too bossy. *ETA: Apparently, “please advise” can be meant to be deferential! Who knew? Don’t worry – when it’s a respectful email in general, I don’t nitpick. I am not affiliated with any of the sources I mention, other than perhaps having developed a nice rapport with the proprietors since I’ve called them to make sure their products are safely gluten free or to make sure they have something in stock before I open the floodgates. In fact, I don’t even really love nuts.com that much, even though I buy a lot of individual flours from them. Their customer service has been lacking at times, and their shipping costs are too high. And, to drive home the fact of my lack of affiliation, I was even careful not to include any amazon affiliate links in the list (and few actual links at all). You do not have to buy any of these products. This is an FYI. These are not the only sources for these products. These are simply my sources. Do you have a better source? Let us all know in the comments! Wondering what to do with all of the individual gluten free flours? Check the Gluten Free Flours Page. It’s all there. Wondering how to use the flour blends? I’ve got that covered too. Don’t want to make your own all purpose gluten free flour blend? Don’t! Unless indicated otherwise, Better Batter gluten free flour (buy it directly from the company and get the best price) and Cup4Cup gluten free flour work in all of my recipes. Wondering how the main commercial blends work? Check out the results of the extensive testing I did a while back. Superfine white rice flour (I buy Authentic Foods brand, on amazon.com because I have a Prime membership so shipping is free) *ETA: I just learned that Vitacost.com just started carrying Authentic Foods flours! Great news. Thanks Erin!! Superfine brown rice flour (I buy Authentic Foods brand, on amazon.com because I have a Prime membership so shipping is free) *ETA: I just learned that Vitacost.com just started carrying Authentic Foods flours! Great news. Thanks Erin!! Pure powdered pectin (I buy Pomona brand online from pomonapectin.com – you use it without the calcium packet) *ETA: I just learned that amazon.com now carries Pomona pectin, and you can even buy it in bulk for a better price. Thanks, Allison! Stock up as little or as much as you like. These are not the only sources for these products. These are just my sources for these products. I am thorough and pretty experienced, but far from all-knowing. If you have better sources for any of these products, please by all means share in the comments below! Especially if you’re outside the U.S. and have found sources, please tell us. P.S. Do you have your copy of Gluten Free on a Shoestring Bakes Bread yet? Some Costco stores sell Honeyville almond flour and other GF food items. Was wondering why “kosher” salt? Thanks!